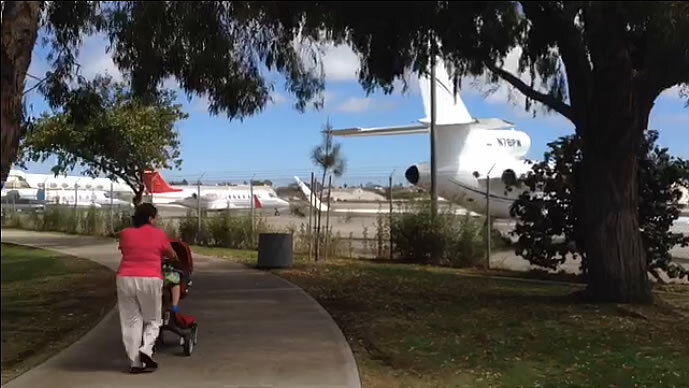 Santa Monica Airport (SMO) has changed beyond all recognition in the last few years. Once, SMO was a small airport with mostly propeller planes, and few, if any, jets. Now jet traffic at SMO is increasing at the rate of 30% year over year. Many large class C & D jets are based at SMO and it had over 14,000 jet operations last year. These changes endanger the health, safety, and well-being of the surrounding community which has risen up in opposition. The battle over SMO’s future has been going on for many years. In response to community concerns, at the March 25, 2014 City Council meeting, the Council directed staff to begin looking into closure of all or part of the airport when the 1984 agreement with the FAA (which currently limits the City’s options) expires on July 1, 2015. At this time all leases at the airport will expire and the City has the right to begin mitigation and/or closure. Two days after the City Council meeting, the Aircraft Owners and Pilots Association ( AOPA ), a national aviation lobby group, began the process of collecting signatures to place an initiative on the ballot designed to tie the City’s hands permanently as far as making even the most trivial change at SMO. This deceptive ballot measure was fronted by “Santa Monicans for open and honest development decisions, sponsored and major funding by Aircraft Owners and Pilots Association (AOPA)”, and was designed to masquerade as an anti-development measure and so piggyback on the recent success of Residocracy. We organized volunteers to counteract these gatherers and had considerable success, however, eventually signature gatherers from around the country were paid up to $20 per signature to make sure the measure got on the ballot. They ultimately succeeded, largely by tricking people into signing. We have many witness statements to back up this assertion. Because the AOPA measure will be so costly and bad for the City and its residents, City Council drafted and placed their own measure on the ballot which, should it gain more votes in November’s election, is intended to nullify the AOPA measure completely, and unlike the AOPA measure, to give the people a real vote on any development (or lack thereof) that happens on any aviation land freed up while preserving the Council’s ability to mitigate adverse aviation impacts up to and including full closure. In the meantime, any land freed up from aviation uses could only be used for parks, playing fields, and other low-intensity recreational uses. For all the reasons you will find described elsewhere on this site, it is critical to the future of Santa Monica and its citizens that the Council measure LC prevails and AOPA’s measure D is defeated. Yes on LC, No on D, The Committee for Local Control of Santa Monica Airport Land (CLCSMAL) was formed by local citizens as a campaign to oppose AOPA’s measure in the November election and support the City’s measure. AOPA is spending vast amounts of money to make sure that the gravy-train of City subsidies forced by the current status quo continues forever. CLCSMAL is fundamentally about ensuring that the City and its citizens, not jet operators and aviation lobby groups based in D.C, get to decide the future land use. This is basically “money vs. many”. This is our land and we want to decide its future. Vote Yes on LC, No on D.